Fat Shark 101 Drone Racing Kit Review - a great first racing drone - dronenr. The Fat Shark 101 is the first drone created by FPV gear maker Fat Shark. This is the first attempt to create an FPV racing drone aimed at getting beginners into the sport. In this review, we will be taking a look at the Fat Shark 101 FPV racing drone to see if its the best option for beginners in the drone racing scene or not? Fat Shark started back in 2007 when Fat Shark founder, Greg French, then into radio controlled cars got into drones with cameras and knew he could make them better. Now taking on 12 years Fat Shark is the leader in FPV gear with around 85% of FPV pilots using Fat Shark equipment. 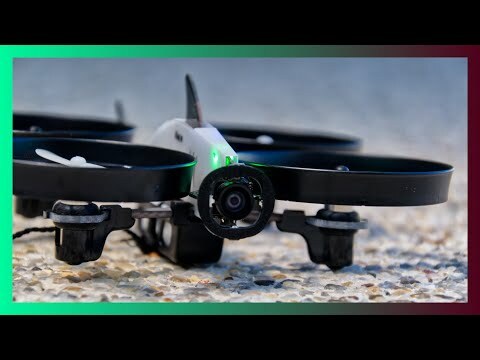 The key selling point for this drone is that its simple to use and a great way for beginners to get into the drone racing world. We can back this claim to a certain degree, for the most part, the Fat Shark 101 is an amazing first timer racing drone with good quality components, a great price, and even some accessories to get you practising for the real races. Keeping in mind that this is a racing drone, you do not have any of the luxuries that come with drones like the DJI Mavic 2 Pro. The Fat Shark 101 does come with 3 modes to help you along your flying journey. Beginner, intermediate and advanced mode, the latter of which allows for full flips and agile movements to be made. Fat Shark 101 FPV Drone Review | dronenr. From the moment you open the box the Fat Shark 101 is arranged in an easy to understand way, with a quick instruction booklet on the top with the drone and rest of the contents just below that. During the learning phase of flying the Fat Shark 101, I crashed many times, making the props and the prop guards to go flying away in a few of the crashes. It was very easy to at the props back on and get back to flying. Most drones only include the drone and the controller, nothing else. The Fat Shark 101 comes with the drone, controller, spare props and motors. You even get a set of racing gates and stands, a free license to the DRL simulator and a few Fat Shark stickers to go along with it all. The Fat Shark 101 is currently available for around $200 from Amazon.com, which is a great price for everything that is included in the box. Along with fairly cheap accessories, making this the perfect drone to start out in the drone racing world. One of the few things I found to be a pain when flying was the flight time of the drone. Only lasting around 11 minutes made the first few flights somewhat frustrating. In between learning to hover and the controls, 11 minutes is definitely not enough when you are starting out. Fat Shark offers some amazing FPV goggles but as far as the one included in the Fat Shark 101 kit it isn’t quite as good as those. When wearing the Fat Shark Recon goggles light bleeds in through the nose cutout and the use of shiny plastic in the goggles itself causes the screen to reflect on all the surfaces and can be a distraction from the screen. The Fat Shark 101 FPV racing drone is perfect for anyone looking to get into the drone racing world. It is the full package, the drone, controller, FPV headset and racing gates to get you race day ready. This is a product we definitely recommend.